The sun has gone down or the clouds have rolled in, but the LIT Reflex Ultra-Reflective Tire brightens up any city cyclist's day with a large reflective band that covers nearly the entire sidewall. The narrow stripes on standard reflective tires are only visible from cars approaching from the side, but the LIT Ultra-Reflective's wide band curves across the sidewall, dramatically increasing the viewing angle so you're visible from nearly directly in front or behind as well. Rough traffic aside, rough roads are no problem either thanks to its file tread design for great all-conditions traction and a hard-wearing rubber compound that ensures long life. Beneath the tread, a robust puncture protection belt keeps out sharp objects for a hitch free ride. 700c x 33 mm. Folding Bead. 60 TPI casing. These tires have a similar tread pattern to my old Panaracer Pasela tires (38). I do miss the tan and supple side walls but these LIT tires are really impressive. I think they have better grip corning for my wet PDX commute and I can run them 45-50 psi for a comfortable ride. I switch to these tires for the ultra-reflective side wall (obviously) but these tires are not a gimmick. They seem to be a high quality tire. I did get a flat soon after riding with these tires but I ran over a thick staple so I am not blaming the tires. I used to run Gatorskins and had flats due to thick staples. Bonus is getting a lot of complements on the look of the side wall...strong utility of a wide reflective side wall but with checkered pattern that adds a bit of unique style to the bike. Also, the 33 wide tire is my sweet spot where I find I get the most comfort with great speed versatility over a wide range of terrain. Overall, I am happy with the purchase. I've had them a few months now and I'm very satisfied. Running them tubeless and no issues so far. These tires are perfect if you want a wide puncture-proof tire with a folding bead and high profile reflective strip. At 700x33 they're not going to fit your standard road bike, but if you have a touring bike, cross bike, or some other form of bike with 700c wheels and a lot of clearance, they should fit. I've ridden this variant of the LIT Reflex for about 14 months now. Only suffered one flat when a construction staple went all the way through the puncture belt. Other than that, these tires are rock solid. They're a bit heavy, but they roll super well and deliver worry-free puncture protection. Also, the manufacturer probably won't recommend this setup, but you could set these up tubeless on the right rim. Consult a bike shop if you're thinking about this. It will make the tires roll even faster as you'll be removing a lot of weight. Sometimes I have to work very early and I was looking for a reflective tire for my roadbike. Clearance. The lit fits perfectly and is really really reflective. I hope my front tire wears out soon so I can replace it with a lit. 6 of 6 customers found this review helpful. I've had these tires on my commuter bike since last fall. I generally only ride this bike in the winter and when the weather is bad. I've put about 2000 miles on the tires and they've held up well. The reflective side walls get a bit grubby looking after a while but this doesn't seem to diminish their reflective properties very much. I had one flat during these miles, which is better than most of the tires I've tried. The tires are pretty lightweight and supple - closer to the performance end of the spectrum. After 2000 miles, the rear is close to the end of its useful life. The front could last a good bit longer. Based on what I've seen and experienced, I'd recommend these to anyone that is looking for a pretty good performance oriented tire for everyday riding. It's not going to beat a continental GP4000s in performance, or a Schwalbe Marathon Plus in durability, but it's a great tire for someone looking for a good all-around performer. 13 of 13 customers found this review helpful. I'm a diehard Gatorskin fan when it comes to my daily commuting bike. But my wife saw these when we were in the shop a couple months ago and thought the reflective sidewall was a good idea. I ride about 17 miles each way to the office and sometimes don't make it home before it gets dark. I was pretty skeptical about buying an unknown brand, but didn't want to argue with my sweetheart, so..
Well, I have to say I'm impressed. I've now got about 1500 miles on them and have had one flat after running over some serious glass (similar experience with Gatorskins). The traction and handling is great. They feel supple and responsive. Frankly, I don't care that much about the reflective stripe (although it does look pretty cool). What matters to me most is performance and durability and these tires do very well - at least as well as the Gatorskins in my experience. Even after 1500 miles, they appear to have plenty of wear left. I've since recommended them to my buddies and when these wear out I'm buying another pair. The tire actually measures closer to a 25 than a 28 which works will on most road bikes since 28 is a bit large for standard brake calipers. The ride is fairly supple which you'd expect from a 127 tpi tire. The rubber compound seems just about right, providing decent traction even in the wet, while still holding up to winter riding conditions. So far, I can't find anything to complain about. Even the reflective sidewall looks pretty slick with the LIT logos. Riding after dark, the tire really lights up giving me a lot more confidence that I'll be seen. My lights do a good job front and back, but from the side the reflective sidewalls really make a difference. I'm impressed. Holds up to street grime well. 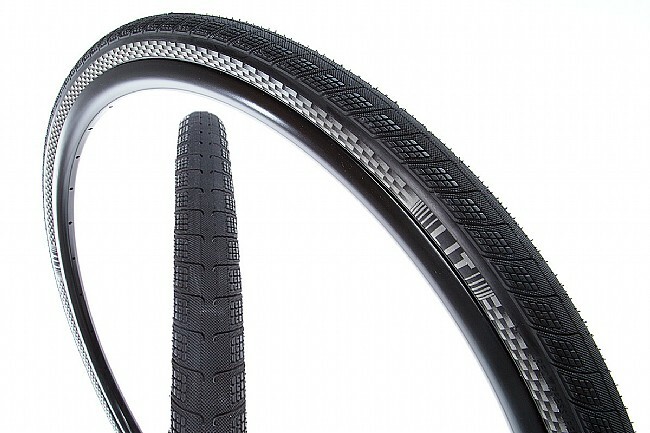 If you're not going to let the winter stop you from commuting to work, these might be the tires from you. Having the extra reflectivity gives you the vote of confidence you need to stay in the saddle during the early morning rides and the evening commute that doesn't end until the sun has gone down again. I've found these to be a great balance of low-price, durability, and low weight. I mounted these on my ti road bike for fitness riding early in the morning, before the sun rises. The reflective sidewalls REALLY catch light and are very noticeable. The tires give a comfortable ride, and the slghtly wider width, as compared to my normal 23c tires, adds to the comfort and does not prevent me from being ok on hard group rides at greater pace. All in all, a good tire. I like it so much that I bought another pair. I rode 3x a week at night and these tires helps other motorists to see me. Good rubber, good reflective tire. A light weight, easy to install, brightly reflective tire. After putting some miles on the tire, I think it's a decent tire. Not very heavy, rolls good, and is a breeze to install. The only exception was the big sidewall looked like a white wall tire on my dark bike. I guess the price you pay for safety. Pick these up for the reflectivity. I didn't believe the package when I read no tools needed but it's for REAL. Easy to put on and easy to pull off, no levers needed. This is a big plus in my book as some tires are a PITA to change. Downfall is that traction isn't the tires strongsuit. Slippery when raining and wet, way better now that it's summer. 4 of 6 customers found this review helpful. After riding these tires for the past couple months or so I have been left wanting more. I installed these tires on my commuter replacing my Vittoria Randoneurs. The second day on them riding home from work my rear tire went flat.. ok, a staple, that would happen to any tire. I replace the tube and continue along my merry way. With out going into too much detail I got four more flats in the next week, all caused by different offending objects (small wire from steel belt radial, glass, more glass... and another staple.. seriously Portland knock it off with stapling things to telephone poles, I can't afford that many tubes), and a new tube was used each time. As far as the ride quality, I felt that these tires were hard (actual consistency of tread rubber) and didn't hold the road near as well as I would have liked (I nearly went down in a corner because the tire lost traction). Riding in SW FL is sketchy no matter what you use. Motorist of every ilk are inconsiderate and inattentive down here, if not downright belligerent. But for that added measure of be seen safety, I picked up these tires. I've been riding the LIT 28mm on my BMC for...roughly 400 miles. Comfortable and no negative issues other than a mushy wobbly feeling on hard turns (could be underinflation on my part) . I believe I will try to squeeze the 32 mm tires in next purchase for non pavement paths. My 6' 190 lb. body yearns for more comfort the older I get. So far, very pleased with this purchase. 1 of 2 customers found this review helpful. I picked up a pair of these tires when they were on sale. I mainly chose these tires for the reflective sidewalls for my commuter bike, though I did not expected them to be so comfortable. After about thousand miles on them, commuting and on longer rides (100k), I can only notice some wear on the rear tire (very typical). The front tire still looks like new. I bought a second pair for another bike. The concept is great but the tires were just to heavy to want to use even on my touring bike. They weigh over 500g each. They would be a good choice for commuting in darkness. The reflective aspect of this tire worked well. I was very visible and felt safer riding at night. The tire itself is good quality. I used them for the first time on a 62 mile ride through bike trails that had debris and rocks. No flats or issues with tire.